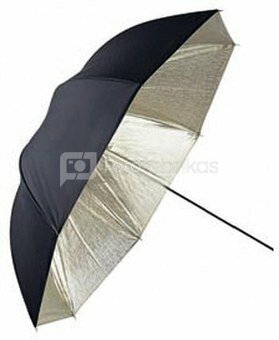 This Falcon Eyes flash umbrella has a golden interior coating and a black, non-translucent exterior fabric. An umbrella with a "sunlight" coating inside reflects "warm" light. Falcon Eyes flash umbrellas are solidly constructed. The tubes have a diameter of 8 mm, so the umbrellas can be used for most studio flashes and continuous lights.